Sitter: Lady Louisa Rosamund Waring, formely Mrs. H.J. Graham-Waffington, n�e (?) ( ). Biog: Widow of Mr H.J. 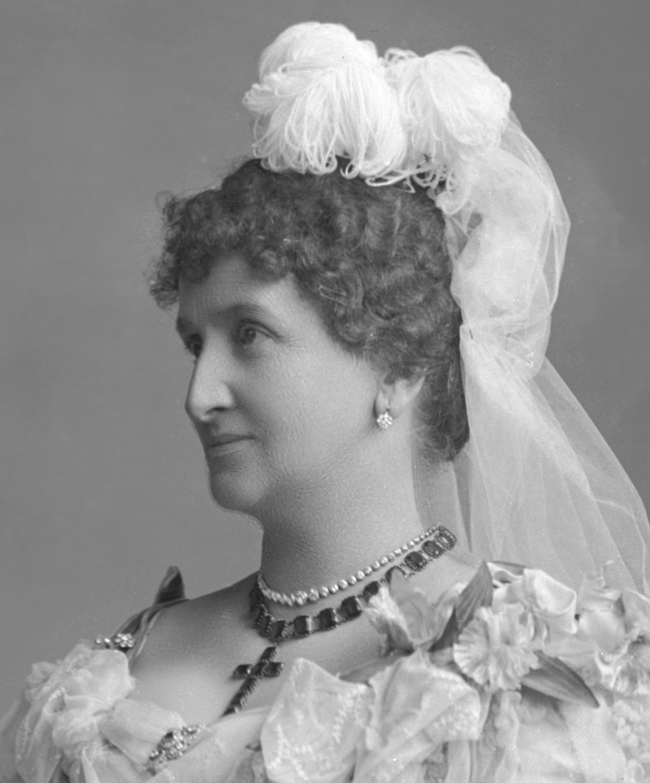 Graham-Waffington; m 2ndly (1897), as his 2nd wife, Sir Henry John Waring (Kt 1891), Mayor of Plymouth 1887-90, Governor of the Imperial Institute (1817-1903). 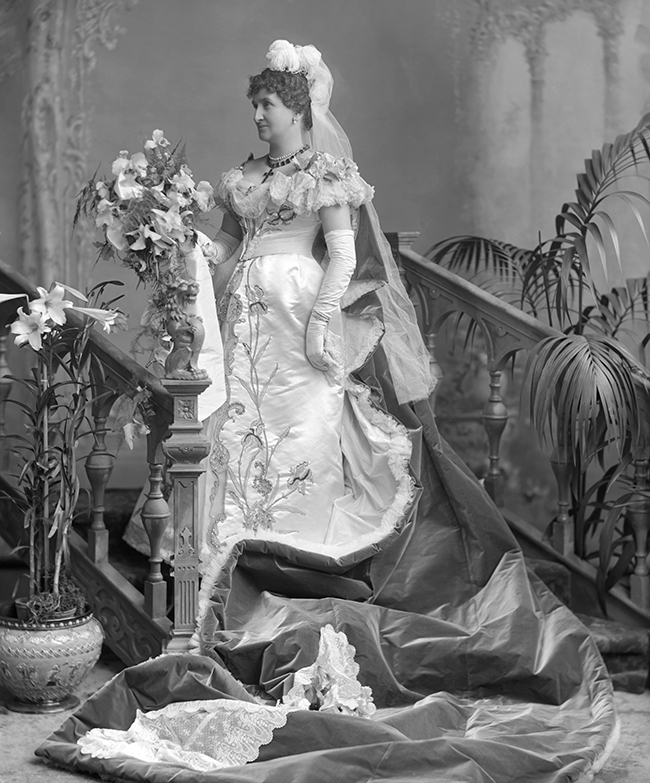 Occasion: The Court, 13 May 1898: presented, on her marriage, by Hon Mrs R. Monck. A gown of white satin, the front of petticoat and corsage embroidered in a graceful design of mauve orchids and foliage in raised chenille. Train in deeper shade of mauve velvet, arranged from both shoulders, and trimmed with old point de Flanders and sprays of orchids. (see: Lady's Pictorial, 21 May 1898, p 746). Furniture & Props: Rococo-style painted backdrop; studio Jacobean-revival mock staircase. Biog: Burkees' Peerage of 1898. Occasion: The Times, 14 May 1899, p 9d. Costume: The Court Circular, 21 May 1898, p 438a; The Gentlewoman, 21 May 1898, p 722a; Lady's Pictorial, 21 May 1898, p 746; The Ladies' Field, 28 May 1898, p 495. Costume Designer: Lady's Pictorial, 21 May 1898, p 746. Costume Supplier: The Court Circular, 21 May 1898, p 438a; Lady's Pictorial, 21 May 1898, p 746. Reproduced: The Ladies' Field, 28 May 1898, p 495; (cropped) Lady's Pictorial, 21 May 1898, p 748.